Sonic & All Stars Racing Transformed on 3DS has a tough job, as it's following up on what some may regard as a surprise commercial and critical success. The console versions of this title, including the one on Wii U, did a wonderful job of combining healthy portions of fan service with thrilling racing action. Yet the gulf in technology is such that re-creating the same experience on the 3DS should be considered a mistake, and a greater focus should go on utilising the handheld's strengths. Unfortunately, round pegs have been forced into square holes for this 3DS iteration, with disappointing results. Aside from menu layouts, the similarities with the Wii U version are striking. We have a substantial range of single player modes and those thoroughly enjoyable tracks, where switching from car to boat to plane is an exciting idea that's — for the most part — excellently done. 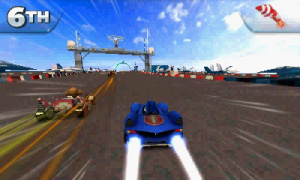 The track design truly is a triumph in most cases, with almost all being themed to classic — and occasionally more obscure — SEGA franchises, so that fans of the spiky-one's studio can rejoice in all of the loving references being thrown their way. When you include a broad range of characters — many to be unlocked in the World Tour — along with a couple of slightly peculiar cameos, you have the foundations of a terrific racer. World Tour is perhaps where most single players will spend their time, an enjoyable progression along branched paths in the quest of completing challenges and earning stars. Three difficulty levels determine how many stars you win, and only those that master the hard difficulty on all tracks will ultimately collect every unlockable character — for those less-skilled, progress to the end of the 5th world can be made with a mix of normal and easy completions. While the sheer volume of rounds sees you revisiting tracks multiple times, the different requirements and adjustments to rules — from racing with single items to speed-boosting against a time limit — keep things fresh. That'll take around half a dozen hours to blast through, and there's then the standard racing fare of five Grand Prix tournaments to defeat and unlock — for those that just want to race without any special rules — as well as Time Attack and Single Race modes; Time Attack picks up lessons from its peers, with staff ghosts to race and defeat. All of these activities, and various acts in races, earn XP for the character you're using, which in turn opens up new pre-sets to focus your racer on speed, handling, acceleration etc; the chase to the next level for your favourite character undoubtedly serves as motivation to ace all of these modes and options. As would be expected of a title such as this, multiplayer is an important feature. 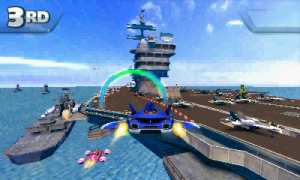 Local multiplayer is included with a full mode for those that own the game, and a borderline pointless Download Play option — the latter only allows one track to be played over and over-again, with no choice of characters. While it's nice to include the option for those without the game to try it out, in this case it feels mean-spirited and rather irrelevant, especially as it won't even throw in some bots to fill out the roster. Online multiplayer is key, of course, and it offers a distinctly mixed experience. On the one hand the small group of players hanging around the servers are matched up very quickly, which is particularly welcome on 3DS, yet the developers made the mistake of giving the gamers complete power over when the race starts. The "host" ultimately declares when the race will begin — at which point participants vote to choose between two random tracks — and in our experience they were incredibly impatient, irritating individuals. As the game bizarrely assigns you a random character when you go online — rather than, say, the one you used most recently in single player — you have to select your character before the race starts. It wouldn't matter, but on multiple occasions we'd arrive in a room only for the host to start a 1 vs 1 race before we could even think about switching characters; this happened too many times to be considered funny. Most players seem keen to race right away — maybe just chasing XP — even if there are only two people in the room, so we never actually raced with the full contingent of eight players. When we were fortunate enough to host and wait for more players to join, other gamers would start dropping out within the maximum two minute waiting time, making the quest for a full race futile. The lesson to be learned? Don't let anonymous gamers call the shots in online lobbies. Regardless of that irritation in the online arena, there's clearly a lot of content to enjoy, just like the home console versions. And yet before you rush out thinking this is Sonic's answer to Mario Kart 7, there's an important point to make — the performance of this title is well below par. We keep comparing this iteration to the Wii U version — favourably, in terms of content — as it seems to be a crudely downscaled version of that very game. We may not be professional game developers here at Nintendo Life, but the idea of taking a game engine designed for HD consoles and stripping it back for 3DS doesn't seem completely sensible; either that was the process, or someone went badly wrong designing this entry's graphics. 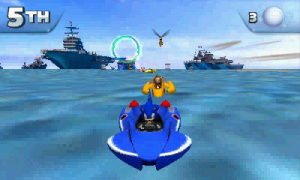 To begin with, the visuals are rather grainy and exceptionally low resolution, with polygons on environmental features that wouldn't look out of place in the Nintendo 64 era. The vehicles are also quite small on screen — which they wouldn't be on a 40-inch TV, naturally — due to a slightly zoomed out camera, while items and pink speed boosts on the road can often be hard to pick out due to the poor resolution, until you're right on top of them. In some of the boost challenges in World Tour, multiple attempts are needed to memorise the locations of boost strips, as on some tracks they can be particularly hard to see. It's not a treat for the eyes then, which makes the juddering frame-rate a major disappointment. With mediocre graphics we should expect smooth racing, but this is an area that truly undermines and spoils the experience for most of the time. Some tracks — typically those less "busy" — run tolerably, and others are an exercise in frustration as the frames dip to aggravating levels. While frames-per-second aren't always the be-all and end-all in every game, they matter in the racing genre, and compared to the home console version and, particularly, Mario Kart 7, this title's performance is quite often borderline unacceptable. Sometimes switching off 3D seems to lead to a small improvement, sometimes it doesn't. And that's the most important part of this game, as the whole concept of conquering different modes and leveling up characters is reliant on the racing action being fun; when the performance is this poor, fun is a rare commodity. When taking on a Time Trial on one of the smoother tracks you can get a glimpse of how this game should perform as a bare minimum, but you may find yourself gritting teeth and battling through most of your races. There is a cursory effort with StreetPass, we feel we should mention, where you trade a license and challenges with other players, though we haven't had the opportunity to test it out. We'd be a little surprised if we do have the chance, as most will probably stick with a certain mascot kart racer already offering a sublime racing experience on 3DS — less modes and wacky track design, yes, but a far superior gaming experience to this. 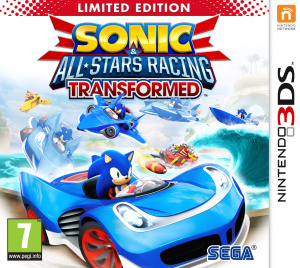 Sonic & All-Stars Racing Transformed on 3DS tries to emulate the terrific offering on Wii U, with what seems like a disregard of its platform. When it comes to fan-service and content it stands tall alongside its HD brethren, yet the positive comparisons end there. This is a classic example of good intentions being undermined by poor execution; muddy, rough visuals are accompanied by a shoddy frame rate, which is a combination to avoid. If you have a Wii U or alternative platform, get the home console version; if you only have a 3DS, we recommend digging out that trusty copy of Mario Kart 7. Aww, this is a shame and no mistake. The Wii U edition was really good fun - probably the game I've played most on the console. I was intending to pick it up on the 3DS in due course. Good review though - saved me a few quid. I totally agree with this. I bought this like 2 days after it came out and immediately noticed bad framerate. I'm at least going to try and suffice through the world tour and grand prix modes, but after that it's going back to gamestop. Yeah the demo didn't impress me much. I heard about the complaints though before even trying it out so I knew what to look for. I'm not sad because there are way too many other games coming out just in march that I want. After playing the demo on my 3DS, you could just tell the lackluster effort that was put into this game. Is it any wonder why third party publishers fail miserably in sales when they make games for Nintendo portable systems? Perhaps if there was more effort? Capcom and Konami have made great looking titles on the 3DS and yet, you still manage to make this game look as good as a DS title in 2005! Put in more time, call the Nintendo hot line, do whatever you folks need to do to create a better, smoother looking game. It's amazing that they crammed the same amount of content into the handheld iterations, but yeah, it's not optimized for 3DS at ALL. It's playable, but...unless you NEED to have it portable, don't bother. If you have a Vita, the Vita version has the same amount of content and looks/runs a lot nicer. It has a few issues with framerate, but not nearly as bad as the 3DS version, and it looks fifty times better. I was talking in terms of handhelds. Crap, I was interested on it. No more racing on my 3ds (MK7 is not very fun). Shame, I haven´t know about the framerate one week before. I have the limited version of this game. Game itself is fun, tracks are good designed, but some places lags and have not frame rate issue, but frame rate lost. Sega released a patch for WiiU, hope for some sort of patch for 3DS release too. This is the only 3DS game that's ever crashed on me and it happened three times! That online is annoying I agree. The graphics aren't superb but I admire the 3D effect it's very well done, better than MK 7. I actually prefer the character models in this over the wii U they just seem cleaner to me. Oh ya, Thomas that frame rate is really terrible you said it. I actually can live with it and not let it bother me though. Yeah.. it's too bad it could have been a real great on the 3DS. Very sad to see such a poor conversion. Sega were once masters of downscaling games to less advanced hardware. I own many a Sega arcade game port on various Sega home consoles. Oh well. Maybe next time. I'm happy enough with the Wii U version,because I can play that off-TV. Another subpar handheld port from SEGA. I'm still a little sore over Sonic Generations, too. Heh. I kind of had a feeling this game was crap the moment I tried the DEMO after grabbing it out of the 3DS eShop. @Banker-Style And you can't play the 3DS version off TV? And I was gonna get this version, because I didn't think I would get a Wii U for Christmas, but it turns out that I got a Wii U and got the Wii U version, I even had the 3DS version preordered, but they delayed the game twice, so then I cancelled it, also Ristar is missing in the 3DS version, and that would have made me very sad if I have gotten the 3DS version first, maybe i'll still get the 3DS version, probably not, the Wii U version is the better choice. Yeah, I was especially disappointed that this version of Racing Transformed is a bit sub-par considering that the DS iteration of the original All-Stars racing was wonderful. Given how well they scaled that game down for the DS hardware, I figured they wouldn't have any troubles making this one work for the 3DS too. Oh well. @MarioMan64 All you need is a backpack, portable outlet(there is such a thing I believe), and your Wii U + Gamepad. I kid you not, I've considered buying a portable outlet. Yeah, after owning the Wii U version for a while, the 3ds version looks horrid in comparison! Yeah this review is accurate. The Wii U version is amazing & one of my favorite titles last year as is the PS Vita version. I played the demo for the 3DS version & it was pretty bad in comparison. I probably wouldn't have thought it was as bad in the graphics department had I not played the Vita version first but there are other issues as well. The framerate is terrible & the sense of speed is just not there. 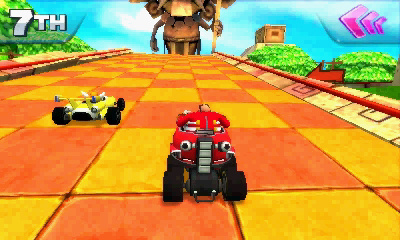 Mario Kart runs better but I think it's also because there's a lot more going on in the Sonic racing games' backgrounds and the 3DS just can't keep up with it all. If you insist on getting this version be prepared to make major sacrifices. This game was meant to be play on console only, why bother with this version when that one is more superior? Usually with ports like this it's expected the handheld version would be the worst. Well, after playing the demo, I was hoping that the frame rate was better in the final version. Well, I won't be grabbing this for my 3DS. When I get a Wii U, maybe I'll grab it for that. Honestly, The game isnt even that bad.. yeah the freezing ,glitching, and frame rate issues will turn anyone off. I went and got the game knowing this.. and it plays fine on majority of the levels especially on exper mode where the races are alot faster. Considering games can be patched on the 3DS... im sure this could be fixed( I hope so anyway). In short, if this gets patched im sure it will have a better rating than this.. though I dont really follow ratings that much if any at all. A mediocre port , MK7 is still the King . I'm afraid this would happen After enjoying the demo I was hoping it would'nt be as bad as it was in the full version. I disagree with all of you. I just went out and bought the game today. I loved the demo, and my only complaint was there were frame issues once in a while, but it didn't ruin the game. This game BEGS to be played in 3D! In 2D it looks lousy. Granted the game could've been better, but as it stands I'd give it a solid 8 out of 10. I tried the demo, which was pretty fun, but I wouldn't but it. Frame rate was definitely an issue, especially when compared to the super smooth MK7. Mario Kart is the only kart racer I need. I still thought it was really noble of Sumo and SEGA to release a demo for this game--saved me some money and just goes to show that they care about their consumers, and that if a game is bad, they aren't going to disguise it. Thanks guys! Disappointing. Glad I chose not to buy on impulse. I'm not that disappointed though. The graphics were terrible and there was lag, EVEN IN THE DEMO. But I might get it anyway. Demo was pretty lackluster. Too bad. The first one on DS was actually pretty good. Transformed just has way too many things going on. Sometimes I can't even keep up with everything going on in the Wii U version! They really should have thought more about how to make the game work well for the 3DS instead of trying to emulate the Wii U experience. Meh. I'd give it a 6 or 7. But if you only have a 3DS, and are sick of MK7 (like I was), this is a worthwhile purchase. If you don't have MK7, get that instead. If you have any other console other than 3DS that this game is on, get that version instead, as it's still a fantastic game... it's just that the 3DS version is the worst version. I do agree with most of the points in this review, though. as smooth as a chili dog? what does that meam? @mariobro4 A chili dog is a bit of an assault on the taste buds, not "smooth" or easy-going on the palette. I was attempting a quip on the iffy port with a link to Sonic, and evidently failed! The weird thing is that I expected mirror of fate to have the framerate problems due to the intense action going on at once instead of this one, but nope, it is the other way around. I played a few times this game's demo but it runs SOOOOOOOOOOOOOOOOOO slow at times and that is very dissapointing because mario kart 7 doesn't have these type of issues and it is the same handheld console. Also some of the characters while you're racing look pixelated, again, a problem kart 7 didn't have. Bottom line, do what thomas said, get the u version of this, and for those who doesn't own kart 7, get it asap. @KnightRider666 I don't know if we played the same demo or not, but a slight framerate issue like the one seen in mgs3d snake eater wasn't that much, it didn't slow the game for long and it didn't froze for a couple seconds, also the graphics were nicer than its ps2 counterpart, all in all it was a match made in heaven for the 3ds. This is where sonic all-stars fell flat, the game freezes while you race and the graphics look all muddy and bland, while mario kart 7 just blinds you with all those bright colors and runs smoothly. I'd give it a 5 or a 6. The demo was awful for me. Thankfully I own this wonderful game on the Wii U instead. This is a terrible glitched port. 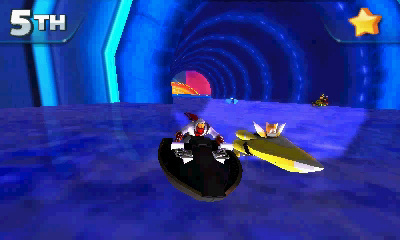 Many times I find my racer during the results screens not transforming when they're supposed to and either fall into the abyss water/space, or judder around in boat or plane form on the track. Also when you win a top 3 spot as Eggman his left hand is colored like his jacket! Who allowed this mess to be shipped out!? I'm definately getting the Wii U version. I was astoundingly disappointed in the demo version and hoped that some redemption could be found within the final product. After reading this review it seems as though they didn't do anything to fix what was bugged about the demo for the 3DS version. I could've let the visuals past had the frame rate not been so bad... Why was the prequel on the DS better than this one? I have the WiiU version and i'm very disappointed with the slow patchs coming from 'Sumo'. There's still some horrible bugs in it and they just stretched themselves to thin by releasing and porting out from the original which already needed more bug fixes first, so now every version has a lot of annoying bugs that should have all been fixed in the early stages before it was ported to everything else. @FOURSIDE_BOY: The game demo never froze on me. Why couldn't they just make a $40 version instead of $30? I mean the same team did great on Mariokart 7. I loved the first DS game and even still play it, even though it's glitchy on 3DS. I had some of the same issues with the demo as the reviewer had with the full game. It feels like the game didn't quite get enough time to be polished up. Even so, I'd still get it if I was a big Sega fan. Having tried the demo myself I am disappointed to see the framerate drop to points where it truly affects how well I can perform during a race. Though if one had no choice and for some odd reason did not want MarioKart 7 instead this could be a passable alternative I guess. 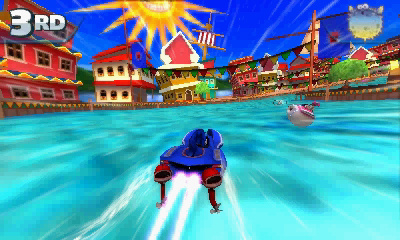 Considering the 60 fps MarioKart runs at I find it hard to see why this couldn't do the same. A rushed port perhaps? I guess when I have a Wii u I'll get the Wii u version! What's worse is that the demo actually freezes in certain parts of the tracks and in the same places every time. The whole thing is a disaster. Such a shame, because I really wanted this game. I think it looks gorgeous and the 3D effect is fantastic, but the framerate and freezing is completely unacceptable. If they're able to patch it, then I will consider getting it, but no way I'm getting this game in its current state. I waited for this game for like 3 months. Then I played the demo....well at least I was able to read the review before I bought it! There is a problem with the environment in this game, though the may be arrows, it's kind of easy to lose track. I kind of dig it, despite the issues. I really wanted to buy this game for my 3DS because I don't have a Wii U but the fps problem ruins everything. But the game is so awesome. Nintendolife, what do you think of the PC version vs Wii U version? Mouse and keyboard isn't the best solution to play racing games but I can use a controller. That apart, what do you think? What the!?!? How....I would've gave it an 8. I had lots of fun with it and did not experience any frame rate issues or lag. Strange. I would've said around 7-7.5, tried the demo. It was okay. But on Wii U, Xbox, and ps3 around 8 or 9. I love sonic games but I was expecting a lot more. A.K.A no lag or cut offs. seriously this is the only 3ds game that just froze on me. Lag aside, the demo wasn't bad — alas, one less game to buy. I really like the PS3 version which I have, so I tried out the demo. Its ok, but the framerate is horrendous. Might buy the first Sonic Racing game on DS since that got a 8/10 here. i know that this game isnt that bad, but i just have hope that nintendo releases a update for the 3ds game to improve the errors...i actually like this game and i had (only sometimes) slow downs but overall, its not a bad game to pick up. Besides i know mk7 is fun and probably better but this game feels great to play when your not playing mk7. Shame. I picked this up and yes, it is extremely grainy. The graphics are terrible, along with the frame rate. If I could see the road ahead of my car, this would have been an MK7 slayer. Looks like iOS and Android will be getting a decent version of this. (Be amusing if the ipad gets a 60fps version like the PC has and supports the controllers). I love this game on other platforms and am sad to see the 3DS version suffers from so many problems. It really is an awesome game.